351 Marlborough is located on the north side of Marlborough, between Gloucester and Hereford, with 349 Marlborough to the east and 353 Marlborough to the west. 351 Marlborough was built ca. 1872 for builder and contractor George Martin Gibson, for speculative sale, one of eleven contiguous houses (337-339-341-343-345-347-349-351-353-355-357 Marlborough). Click here for an index to the deeds for 351 Marlborough. On November 15, 1873, 351 Marlborough was purchased from Hiram Gerrish by Joseph McIntire and Elbridge G. Knight, partners in the firm of Knight & McIntire, wholesale provisions (produce) merchants. 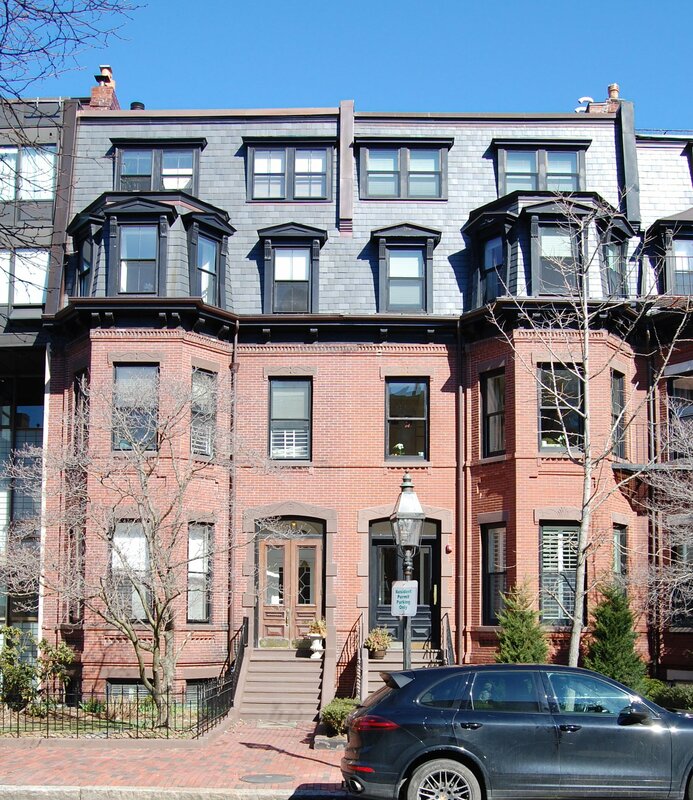 On the same day, Hiram Gerrish also sold them 347 Marlborough, and sold Joseph McIntire 337 Marlborough, 345 Marlborough, 355 Marlborough, and 357 Marlborough. They purchased the houses as rental property or for re-sale. By 1875, 351 Marlborough was the home of William Sanford Butler and his wife, Charlotte F. (Whittridge) Butler. They had lived at 78 Appleton in 1874. William Butler a dealer in dry goods and fancy goods. Charlotte Butler died in November of 1881. William Butler continued to live at 351 Marlborough with their children, Lottie, Frances, and William Edward Butler. He remarried in February of 1884 to Mrs. Margaret Jane (McDonald) Folsom, the former wife of George Warren Folsom. It appears that she was the Mrs. Maggie J. Folsom who was listed in the City Directories from 1878 to 1883 as a “magnetic physician.” After their marriage, they lived at 351 Marlborough through the 1885-1886 winter season, after which moved to Brookline. On July 7, 1887, 351 Marlborough was acquired from Joseph McIntire and Elbridge Knight by attorney Lyman P. French. He and his wife, Mary Elizabeth (Fairchild) French, made it their home. They previously had lived at the Hotel Brunswick (southeast corner of Clarendon and Boylston). Mary French died in September of 1890, and Lyman French moved soon thereafter back to the Hotel Brunswick, where he committed suicide in January of 1892. 351 Marlborough was not listed in the 1891 Blue Book. During the 1891-1892 winter season, 351 Marlborough was the home of Herbert Merriam and his wife, Fanny (Hawes) Merriam. Herbert Merriam owned and operated Cherry Brook Farm in Weston, which also was their primary residence. By the 1892-1893 season, they had moved to 163 Beacon. On October 7, 1892, 351 Marlborough was purchased from Charles F. Fairbanks, guardian of the Frenches’ two minor children, Katharine French and Mary Letitia French, by Ellen L. (Hayes) Meany, the widow of stone and marble dealer Edward F. Meany. Their son, T. Francis Meany, who continued to operate his father’s business, lived with her. They previously had lived at 5 Gloucester. Ellen Meany died in October of 1897. T. Francis Meany continued to live at 351 Marlborough during the 1897-1898 winter season, but moved thereafter to an apartment at 333 Commonwealth. On July 17, 1899, 351 Marlborough was purchased from Ellen Meany’s three surviving children – Katherine L. (Meany) Motley, the wife of William H. Motley, T. Francis Meany, and James G. Meany – by Henry Winchester Cunningham. He married in October of 1899 to Mary May Hayward and they made 351 Marlborough their home. Prior to their marriage, he had lived at 31 St. James and she had lived at 346 Marlborough with her mother, Mary Bartlett (Vose) Hayward, the widow of Isaac Davenport Hayward. Henry and Mary Cunningham also maintained homes in Manchester and in Milton. Henry Cunningham was retired, having been associated with the Continental Sugar Refinery and Boston Cooperage Company until they were acquired by the American Sugar Refining Company in 1882. He was a noted genealogist and antiquarian. From about 1902, Mary Cunningham’s brother, Roland Hayward, a stockbroker, lived with them. He was unmarried and had lived at 346 Marlborough with their mother until her death in September of 1901. He continued to live at 351 Marlborough in 1904; he died in April of 1906 in Milton. In 1920, Henry and Mary Cunningham were joined at 351 Marlborough by his mother, Lucinda Stearns (Winchester) Cunningham, the widow of James Henry Cunningham. She previously had lived at 104 St. James. By the 1920-1921 winter season, she had moved to 341 Marlborough. Mary Cunningham died in February of 1929, and Henry Cunningham died in October of 1930. The house was not listed in the 1932 and 1933 Blue Books, and was shown as vacant in the 1931-1933 City Directories. On July 14, 1933, 351 Marlborough was acquired from Henry Cunningham’s estate by S. Elizabeth Hodson, a secretary in a real estate office, and on July 31, 1933, she conveyed the property to Dr. John Stephen Scott. He and his wife, Helen G. (Davis) Scott, made it their home. They previously had lived at 31 Alveston in Jamaica Plain. He was a dentist and maintained his offices at 110 Newbury. In November of 1935, he filed for (and subsequently received) permission to repair the gable of the house, which had been damaged by fire. 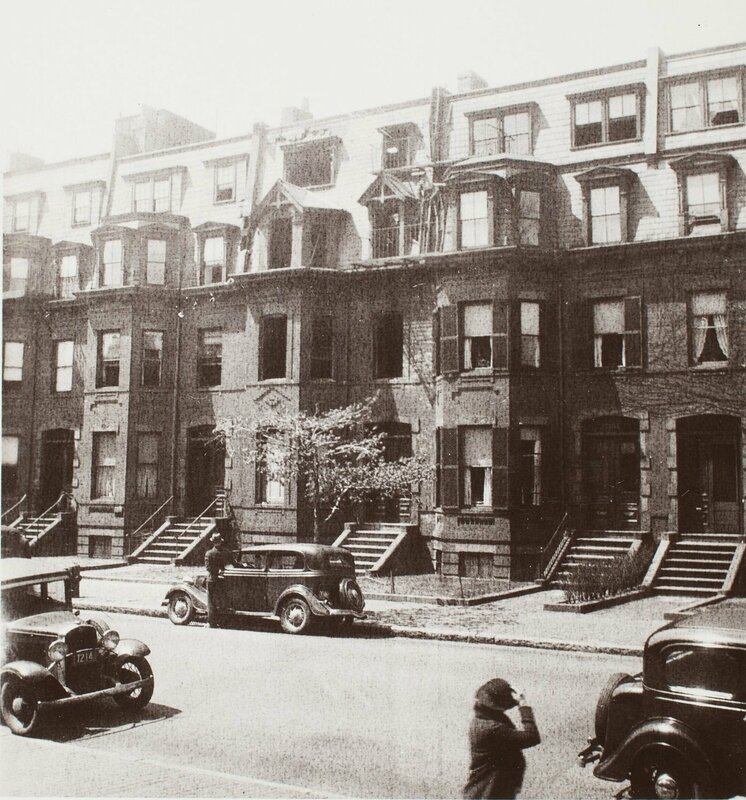 The Scotts continued to live at 351 Marlborough until about 1940, when they moved to the Hotel Hamilton at 260 Clarendon. 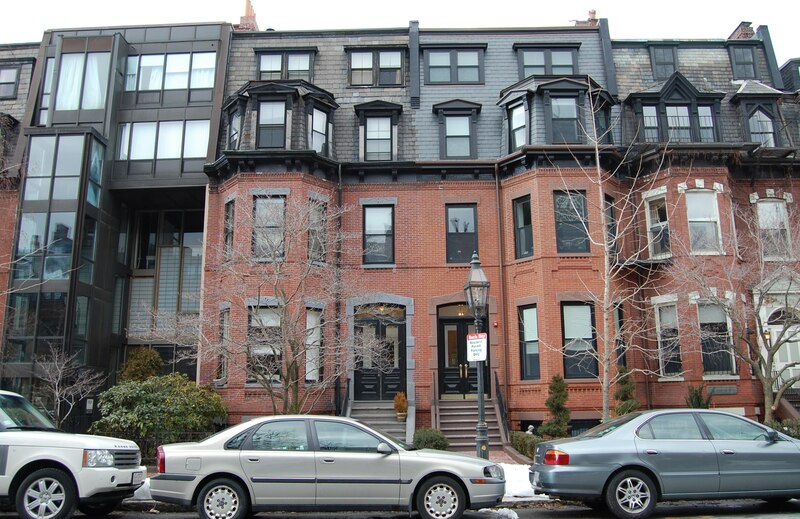 He continued to maintain his dental offices at 110 Newbury and to own 351 Marlborough and lease it to others. By 1941, 351 Marlborough was the home of Henry Bradlee Fenno, a real estate broker. He had lived at 450 Beacon in 1940. He died in July of 1941, and the Scotts moved back to 351 Marlborough. By 1943, they had moved to 274 Clarendon. In 1942 and early 1943, 351 Marlborough was the home of Harold Mills Baptiste and his wife, Louisa R. (Neane) Baptiste. He operated the Baptiste School of Dancing at 14 Newbury. Their usual residence was in South Lincoln. By 1944, 351 Marlborough was the home of Katharine (Weld) Bennett, the widow of Bradford D. Bennett. She previously had lived at 15 Charles River Square. On February 4, 1944, J. Stephen Scott transferred 351 Marlborough into his and his wife’s names. On July 20, 1944, 351 Marlborough was acquired from the Scotts by Wesley Lovejoy Boynton, a music teacher. His mother, Helen F. (Short) Boynton, the former wife of Walter Edgar Boynton, lived with him. Wesley Boynton previously had lived at 2 South Cedar Place, and his mother previously had lived in Dracut. They operated 351 Marlborough as a lodging house. Among the lodgers at 351 Marlborough were Rhoda Whitham and Edith Williams, both of whom previously had lived at 2 South Cedar Place and had appeared in musical performances with Wesley Boynton. On August 2, 1944, he transferred the property to himself, his mother, and Rhoda Whitham. Edith Williams moved by 1946. Wesley Boynton, his mother, and Rhoda Whitham continued to live at 351 Marlborough until about 1947. 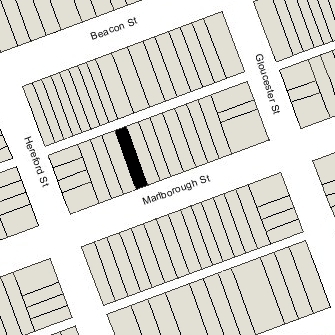 On November 10, 1947, 351 Marlborough was acquired from Wesley Boynton, Helen Boynton, and Rhoda Whitham by Perez Robert Avigdor and Donald Copeland Carter, who lived at 351 Marlborough and operated it as a lodging house. Perez Avigdor was vice-president of the Moustapha Avigdor Galleries at 120 Newbury, dealers in oriential rugs and art objects. He previously had lived in Lexington. Donald Carter was a salesman with the gallery. He previously had lived in an apartment at 4 Commonwealth. Donald Carter’s parents, Percy Niles Carter and Blanche E. (Copeland) Carter, lived with him at 351 Marlborough. They previously had lived in Reading. The Carters and Perez Avigdor continued to live at 351 Marlborough until about 1951. The property changed hands and on November 2, 1953, was acquired by Robert E. Bacon, as trustee of the Nobscot Realty Trust. He and his wife, Lillian (Farr) Bacon, made it their home. They previously had lived in Granby. He was an engineer. In January of 1954, he applied for (and subsequently received) permission to convert the property from a single-family dwelling into a single-family dwelling and lodging house (legalizing the current occupancy). They continued to live at 351 Marlborough until about 1956. On June 19, 1956, 351 Marlborough was acquired from Robert Bacon by Avard Cummings Sproul and his wife, Kathryn Ashton (Gibbs) Sproul, who operated it as a lodging house. They previously had lived at 389 Marlborough. They continued to live at 351 Marlborough in 1959, but had moved to Cambridge by 1960. On May 15, 1959, 351 Marlborough was acquired from the Sprouls by telephone company executive Frank Henry Rowland, Jr., and his wife, Rose (Cunningham) Rowland. 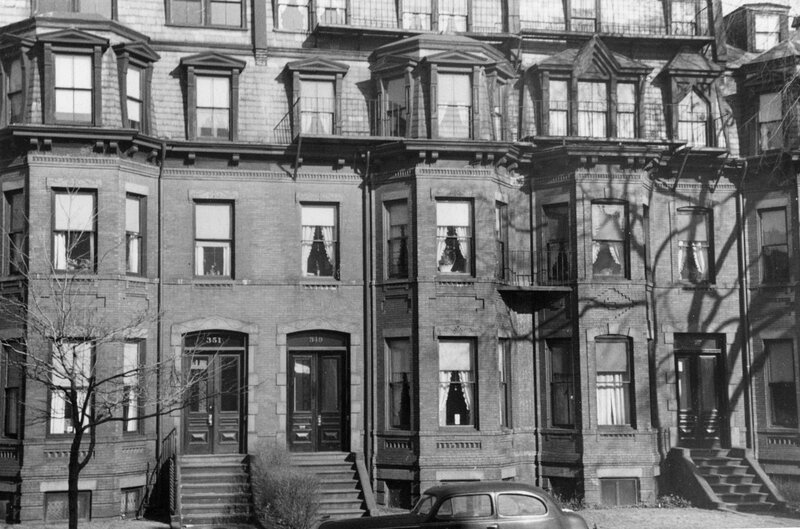 They lived at 349 Marlborough, which they had converted into apartments in 1951. In July of 1959, he filed for (and subsequently received) permission to convert 351 Marlborough from a single-family dwelling and lodging house into five apartments. In an appeal related to his application, he indicated that, when he purchased the house, the property was operated as a furnished apartment and guest house, with five complete bathrooms (one on each floor) and complete kitchens on three floors. On June 5, 1962, 351 Marlborough was acquired from the Rowlands by Berthe L. Lessard, employed with the Craftsman Life Insurance Company, who lived in an apartment at 580 Commonwealth. On July 15, 1964, 351 Marlborough was acquired from Berthe Lessard by Lawrence Clarke Hill, Jr., and his wife, Dorothy Carol (Clark) Hill, who lived in one of the apartments. They previously had lived in an apartment at 396 Beacon, where his parents, Lawrence Clarke Hill and Emilie (Parrock) Hill, also lived. The property changed hands and on May 7, 1985, was purchased by Kenneth J. Torlone, trustee of the 351 Marlborough Trust. 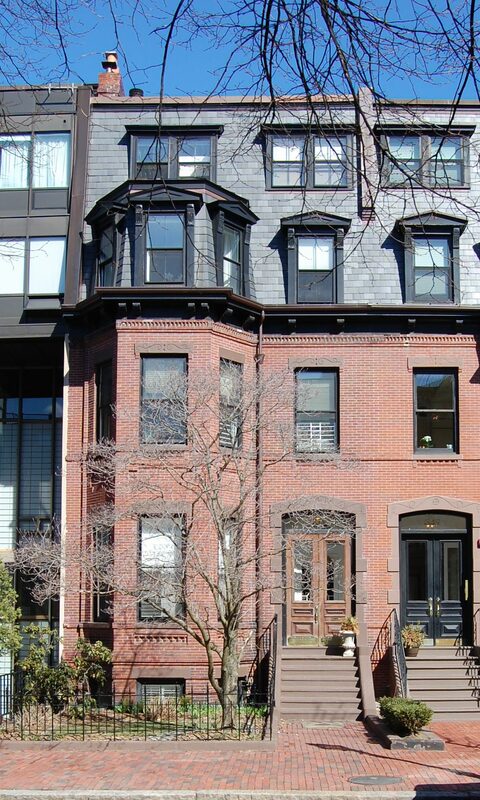 On October 10, 1985, he converted the property into five condominium units, the 351 Marlborough Street Condominium.